The main goal of OpenITI mARkdown is to provide a simple system for tagging structural, morphological and semantic elements in premodern and early modern Islamicate texts that are being prepared within the framework of the OpenITI Project. The use of OpenITI mARkdown will allow one to engage in the computational analysis of texts in the same way as more complex and time-consuming tagging schemes (like TEI XML). 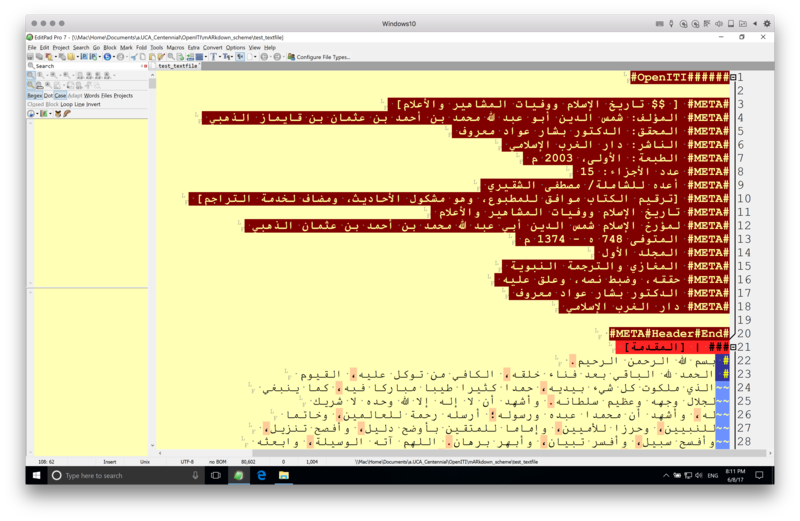 The main goal of OpenITI mARkdown is to provide a simple system for tagging structural, morphological and semantic elements in premodern and early modern Islamicate texts of the OpenITI corpus. 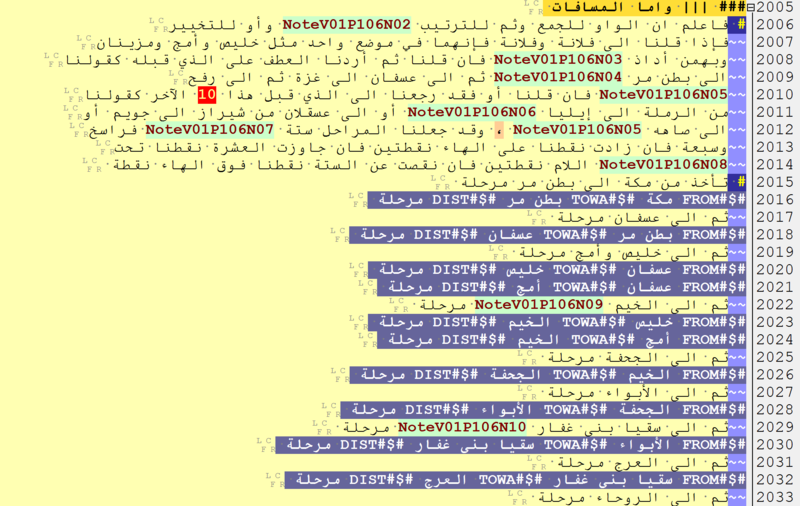 The use of OpenITI mARkdown will allow one to engage in the computational analysis of texts in the same way as allowed by the more complex and time-consuming tagging schemes such as TEI XML; OpenITI mARkdown will also facilitate the conversion of the large volume of Islamicate texts into TEI XML, which is now the standard format for digital editions. In principle, OpenITI mARkdown does not require any special editor, but the current implementation relies on EditPad Pro, which supports right-to-left languages, Unicode, and large files. However, it is the support of custom highlighting and navigation schemes that makes this text editor particularly convenient for OpenITI mARkdown. OpenITI mARkdown is not meant to be a comprehensive standard, but rather a light-weight tagging scheme that renders texts machine readable and can be adapted to specific research tasks. The scheme consists of a set of unified patterns, but also includes custom patterns that facilitate analysis of specific types of data. These patterns can be divided into structural (unified), morphological (unified, customizable) and semantic (unified customizable, but also custom). The scheme currently accommodates a variety of research inquiries. Texts in OpenITI are automatically converted into OpenITI mARkdown, and in most cases, only structural tagging is required—in other words, tagging headers of chapters, sections, subsections and and other logical units. Download and install EditPad Pro. EditPad Pro works on Windows only; if you are using Mac or Linux, you can still use it with some virtualization option; the combination of Parallels, Windows 10 and EditPad Pro works well on Macs (The size of the virtual machine with Windows 10 is only about 10-15Gb). Download OpenITI mARkdown schemes from GitHub (https://github.com/OpenITI/mARkdown_scheme), and unzip, and copy all the files into %APPDATA%\JGsoft\EditPad Pro 7 (Note: make sure that EditPad Pro in not running: you need to do File > Exit to completely close it). The scheme is automatically activated in EditPad Pro by the first line in the file, which must be: #####OpenITI# (called magic value in EditPad Pro). Texts in the repositories of the OpenITI Project have already been preprocessed and basic structural tags should already be implemented. Opening any of these texts in EditPad Pro should automatically activate OpenITI mARkdown scheme. NB: Since the corpus is work in progress and many texts have not yet been manually edited, tags that may appear in texts do not necessarily correspond to proper OpenITI mARkdown tags! the headers of chapters (### |), sections (### ||), subsections (### |||), etc. The entire text of a header must be on the same line (the entire text of the header will be highlighted, if everything is correct). If a logical unit is tagged correctly, the color of a tagged unit’s header will change accordingly. NB: On the general organization of OpenITI, see the relevant section. An OpenITI mARkdown file includes three main sections, which are shown on the screenshot above. They are 1) magic value; 2) non-machine readable metadata header; 3) text of the book proper. Magic value is the first line of text in the file that that activates the OpenITI mARkdown scheme in EditPad Pro. This value is ######OpenITI# (nothing else should be on the first line of the file, otherwise the scheme will not be activated). After these two elements, the text of an edition begins. The first two elements are separated from the text of an edition with the line that contains the following: #META#Header#End# (Again, this is the only element that must be on the line). The screenshot below shows all thee main elements at the top of a OpenITI mARkdown file. OpenITI mARkdown: the three main sections of a document. Tagging patterns in a text fall into two main groups: 1) structural patterns, which include basic structural patterns & logical unit patterns; and 2) analytical patterns, which include morphological patterns, semantic patterns & a small numbers of custom analytical patterns. The main difference between these two groups can be described as follows. Elements of the first group can be found in printed versions of texts, and thus, the tagging of these elements can be performed by anyone who has basic familiarity with Arabic script and has an ability to collate digital text with its printed original. Elements of the second group can be inserted in a text only by those who are well acquainted with that specific text, and thus, tagging with analytical patterns is to be performed by scholars for specific research purposes. In terms of the workflow, tagging of structural patterns must precede tagging with analytical patterns. Basic structural elements include the following. Basic structural elements have been automatically implemented in all the texts of the OpenITI, although, because of the inconsistencies in initial formatting of these texts some issues remain. Basic structural elements include 1) paragraphs; 2) page numbers (whenever applicable); 3) verses of poetry, and 4) milestones. In premodern Arabic texts paragraphs as units are not particularly reliable. Yet, if a certain electronic text reproduces a printed edition, it is worth preserving its division into paragraphs. Each paragraph begins with a hashtag, #. While EditPad Pro handles large files very well, it has problems with long paragraphs (or, more correctly, lines). For this reason, long paragraphs are split into shorter lines, where each line starts with ~~ (two tildas). OpenITI mARkdown: Example of paragraphs. Most of electronic texts preserve pagination. OpenITI mARkdown supports the following format PageV##P###, where V## is the volume number, and P### is the page number. Volume number must be two digits, page number—three (padded with zeros when necessary). Thus, PageV05P022 stands for Vol. 5, p.22. Page number tags are inserted at the end of the corresponding page. In some texts this is not properly implemented yet. For an illustration, see “Milestones” section below. Each verse must be on its own line (beginning with a paragraph tag # ), and hemistichs divided with %~% (when not applicable this tag can be places either at the beginning of the end of a line). Verses are not tagged consistently through out all the texts, since the tagging of verses was not consistently implemented in the initial versions of texts. OpenITI mARkdown: Verses of poetry (lines 856-858). Milestones (Milestone300) are automatically inserted tags that split texts into 300-word units. Having an ability to split text into equal chunks is helpful for a variety of analytical approaches. These tags should not be moved or removed. OpenITI mARkdown: A pagination tag and a milestone tag. Logical units are the main units into which a specific text is divided, i.e. chapters, sections, lexical entries, biographies etc. All major sections of a text usually have headers. Headers of sections are tagged in the following manner: 1) ### — three hashtags at the very beginning of the line; 2) which are followed by the pipe symbols—| —whose number corresponds to the level of a header; 3) the pipes are then followed by the text of the header, which must be on this line entirely (i.e., followed by \n, “new line” character). If there is no text header, the line may remain empty (after the pipes). The animated image below demonstrates the tagging of headers. Each level has its own color (following the rainbow colors), if tagged correctly. OpenITI mARkdown: Chapters, sections, subsections, subsubsections, etc. Editorial sections are tagged with ### |EDITOR|, which also must be on a separate line. For sources that are made of serial units of information—for example, biographies in biographical collections; lexical, onomastic and toponymic entries in dictionaries; descriptions of events in chronicles and the like—there is a series of tagging patterns which classify those units of information. Current patterns do not cover all relevant cases and will be added on as-needed basis. Using OpenArabic mARkdown, one needs only to mark the beginning of each information unit. Each unit can be marked with either a simplified or full tag. Simplified tags are short, which makes them ideal for manual tagging. Simplified tags are, however, ambiguous. Full tags are more readable and source independent. Full tags are particularly important when information from multiple sources are processed at the same time. NB: ### @ RAW can be used to tag blocks of historical events when it is not immediately clear when one information unit ends and another begins. With these tags in place, one can return to an unfinished batch later, read it more carefully, and split properly into single units. There is also, of course, a conceptual and methodological issue with regard to what constitutes an ‘event’. For the purposes of algorithmic analysis, [the “description of an] event” is a structurally and thematically complete unit of text that describes an entity that has 5 properties: subject, predicate, object, time and place. In other words, it is something that can be grouped into categories, graphed across time, and mapped in space. OpenArabic mARkdown: Tagging biographical units with full tags. You can see here how first the unit is not highlighted because of a typo. You can also see one of the common problems that come from combining RTL and LTR text—visually the tags look like they were not typed properly (BIO_MAN$, instead $BIO_MAN$). The following tags are section tags to be places at the beginning of a relevant section: (1) ### $DOX_POS$ for sections dealing with doxographical/theological positions; (2) ### $DOX_SEC$ for descriptions of religious groups (“sects”). These can be used doxographical texts where information is presented in a serial fashion (i.e., the entire text is made of doxographical units of these kinds); in texts that address doxographical issues on top of other things, morphological pattern should be used. Analytical patterns are meant to provide scaffolding for tagging complex entities in such a way that would allow for complex automatic manipulation of tagged data for the purposes of computational analysis. The analytical patterns are meant to be adjustable for specific research questions and include semantic and morphological patterns. Semantic patterns are used to tag specific types of named entities (e.g., toponyms, individuals, date statements, sources, etc. ), semantic contexts (see, Open Tagging Pattern), and morphological units, or thematic text passages. These tags are used to provide relevant metadata to specific words and phrases. In other words, you use these to identify certain words or phrases as references to toponyms, individuals, date statements, sources, and social/onomastic descriptors. The list of taggable named entities will be expanded. All tags have similar structure @ + CODE + two numbers. CODEs have two variations: 1) long (three letters) and 2) short (one letter). Triliteral CODEs are used for automatic tagging with scripts and entity lists; one-letter short CODEs are used for manual tagging and disambiguation of automatic tags. the length of the entity. If the entity is a bigram (Madīnaŧ al-Salām), number 2 must be used (both words will be automatically highlighted). NB: The tags have two varieties: a long one and a short one. The long one will be used for automatic tagging (the automatic tagger is in progress), while the short one will be reserved for manual tagging, as shorter tags are easier to type in manually; additionally, the conversion of an automatic tag into a manual one in the process of edition and disambiguating is more efficient by deleting two characters, rather than adding them. YB#### — a year of birth, as mentioned in a biography; for example, @YB510 means that a biographee was born in the year 510 of the Islamic hijrī calendar. YD####—a year of death, as mentioned in a biography; for example, @YD597 means that a biographee died in the year 597 of the Islamic hijrī calendar. YY####—any other type of year references mentioned in a text. YA#### — age in years. OpenArabic mARkdown: Years AH (here, years of birth). OpenArabic mARkdown: ‘Sources’ and toponyms. [NB: accidentally, the highlighting is dropped from the current scheme; it will be added in the next version.] This pattern is easily adjustable for tagging specific semantic contexts. Unlike the named entities tags above, these serve only as pointers to a relevant context, and are not meant to be connected to specific vocabulary in a text. The overall pattern is @USER@CAT_SUBCAT_SUBSUBCAT@, where USER is an alias of a researcher introducing a pattern (three-letter initials is an option—MGR in my case); CAT_SUBCAT... represents categorical branching, where categories are defined by a researcher for specific purposes. Above is a snapshot of a scheme that I used for tagging biographies of preachers. In this example, I am looking into individuals involved into two different forms of preaching—waʿẓ and ḫuṭbaŧ, their education backgrounds and topics of their sermons. Thus, my tag in the case of a wāʿiẓ who had training in fiqh will look as follows: @MGR@WACZ_education_fiqh@. In combination with chronological, geographical and social information (derived from nisbaŧs), one can get a perspective on how many individuals involved in waʿẓ had training in fiqh and if there are any chronological, geographical and social peculiarities to this information. It is vital to keep track of tags one introduces and avoid creating too many of them. Another useful strategy is to keep them short, for instance: @MGR@WCZ_ed_fqh@ (it is your own decision, of course, how to balance brevity and readability). #~:category: , where category is defined by a scholar for relevant research questions. #~:undefined: can be used to tag the beginning of a passage without assigning a category. While starting to work with a new text, it makes sense to use only #~:undefined:, until categories start to flesh out from tagged examples. #~:undefined: can also be used as a pseudo closing tag, when only specific morphological elements need to be tagged (Let’s say, you are interested in tagging only letters in a vast text: you add #~:letter: in the beginning of the relevant passage, and #~:undefined:—at the end; both go on separate lines between morphological passages). The tag can be followed by semantic keywords, following the format of the Open Tagging Pattern (see above). OpenArabic mARkdown: An example of a biography tagged morphologically and semantically. These patterns are designed to tag very specific structures in texts and for the moment there are only two main patterns that are used in particular research projects. The point of these tagging patterns is to provide just the bare minimum of structure into a natural text so that is could be parsed with a script and converted into machine-readable data. Geographical texts—such as comprehensive geographies—contain a lot of data that can be used for modeling historical processes in space. Of particular importance are administrative divisions and trade routes, which often come with distances. Data tagged with these patterns can be computationally manipulated. For example, see geographical divisions from al-Muqaddasī’s Aḥsan al-taqāsīm fī maʿrifaŧ al-aqālīm visualized in a sunburst graph, or this comparison of al-Muqaddasī’s data with that of Cornu (Credits: Masoumeh Seydi, Leipzig University). Note: Clip collection can be used to insert relevant patterns into the text. Each riwāyaŧ/ḥadīṯ report should be treated as a separate paragraph: new line + # $RWY$ ; in order to mark the boundary between isnād and matn, @MATN@ tag is to be inserted between isnād and matn. Since it is not uncommon to have an evaluation of reported material, tag @HUKM@ can be used to tag the beginning of the ḥukm-statement. All three elements of a riwāyaŧ/ḥadīṯ must remain the part of the same paragraph. contains matn @HUKM@ this section contains ḥukm . It is not uncommon that either isnād or matn is missing. In such cases @MATN@ tag still must be inserted: in the case of missing isnād, @MATN@ directly follows # $RWY$ ; in the case of missing matn, @MATN@ becomes the last element in the ḥadīṯ paragraph. @HUKM@ is optional and inserted only when there is a ḥukm-statement. OpenArabic mARkdown: An example of tagging riwāyāt in Ibn al-Jawzī’s Talbīs Iblīs. The following regular expression can help to visually identify sections with isnāds (copy-paste it into the search window of EditPad Pro). The screenshot below demonstrates how a passage of text with lots of transmission terms becomes visible in the sea of text. OpenArabic mARkdown: Passages with transmission terms automatically highlighted with the regular expression (Text: al-Ḏahabī’s Taʾrīḫ al-islām). Occasionally it happens that highlighting scheme loses its track and gets shifted, highlighting wrong elements. One of the things that may trigger this behavior is a long regular expression in a search field, but sometimes it happens for some other reasons. This can be fixed through refreshing the highlighting scheme by going through the following steps: [Options >] Configure File Types... > Color Syntax > Refresh (Ok). Folding lines is a very convenient tool, but it seems to take a while before for it to load when one opens EditPad Pro. This can be fixed by going through the following steps: [Options >] Configure File Types... > Navigation > Refresh (Ok). Pagination in multivolume texts is sometimes problematic in the following manner: in some volumes page numbers are given at the beginning of a page, while in others—at the end; this is not a major issue, but needs to be fixed eventually; a solution may incude an introduction of more specified tags PageBegV00P0000 and PageEndV00P0000. These tags can be then automatically unified (or, perhaps, preserving both page ‘margins’ which would mark the end of one page and the beginning of the next: e.g., PageEndV05P0456 PageBegV05P0457). ~~ and # can be dropped and \n\n to be added between logical units (headers, paragraphs), as in the original markdown; this will make it easier to edit texts and there will be less mistakes.